A J Stieger’s Mindwalker gets off to a slow and almost reluctant start, in that the narrative comes off as a little middle-grade-like rather than YA. However, it eventually picks up speed and plunges you into a heart-pounding bittersweet journey of mind, heart and soul. Lain is very a sympathetic and compassionate lead, so much so that her incessant need to help people overrides her sense of self-preservation. That does not mean she is not cautious, she simply looks at the reasons underpinning the risks and attempts at deconstructing it with compassion and understanding. She quickly becomes quite taken with Steven, but once the reader understands the above traits, her attraction to him is reasonable in the circumstances, if not ordinarily reasonable. She does not even register that he is physically attractive until the later portion of the book. Steven on the other hand, is impulsive, erratic, suspicious and deeply traumatised. I loved his quietly flirtatious sense of humour. His nervous energy was infectious and working through his dark and painful past and the influence thereof was heart-breaking. His fierce protectiveness of Lain was well-qualified and not arbitrary like the more generic YA male leads. Their relationship was beautiful, in a bittersweet way. It was subtle yet fierce and built on a foundation of trust, understanding, unconditional loyalty rather than animal magnetism. Although, there is a bit of that too. Ian was another good element to the narrative, a decent supporting character whose dynamics between Lain, Steven and him was well depicted. It was realistic yet unpredictable and I would love to see more of him in the future. Steiger does not shy away from realities of severe trauma. While some YA novels may lead you to believe that finding that special someone, confronting your demons, finding the truth behind it and/or even punishing those responsible, frees you of your trauma, Steiger posits, that it remains with you. It is simply a matter of having an anchor/reason that helps you manage it, eases its crippling hold and making the exercise worthwhile. The world building was fantastic, very Spielberg’s Minority Report, which is one of my favourite futuristic settings so I was a happy reader indeed. The language is quite understated and does not bombard you with traumatic imagery given the circumstances. However, that does not mean that the very honest and raw experiences of the leading characters is in anyway insufficiently depicted. Finally, Steiger’s takes on mental disease was confronting and arguably not a large departure from reality. 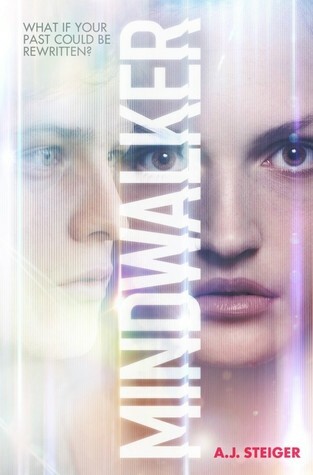 Mindwalker introduces a world where people are classed according to their mental stability, the shrinks are in charge. The stable hold positions of power and prestige and the unstable are relegated to menial jobs. Where the trauma is minimal and one has the financial means, one can go through conditioning or erase their memories of it. Where the trauma is extensive and manifests in self-harm or harming others (actual or risk of) individuals are treated to a law-ordered mind-wipe or strongly advised to commit suicide by way of a simple pill. But for the impoverished and diseased there is little choice. Prevention and rehabilitation has been substituted for avoidance. I have mentioned the lack-lustre start already and I cannot emphasize enough about being patient during those initial chapters because the narrative, once it embeds into your head, will blow your mind! So all in all, there was absolutely nothing I did not enjoy about this read. I eagerly look forward to the next instalment of what I believe may be a duology or trilogy. In conclusion, Mindwalker is a quietly strong and thought provoking YA psychological thriller from a debut author to watch out for. It is a uniquely riveting page turner and I highly recommend it.